WHO: Now in its eighth year, Bob Childers’ Gypsy Café will showcase 60 Oklahoma songwriters, including perennial favorites like Stoney LaRue, Kaitlin Butts, Mike McClure, Randy Crouch, Mike Hosty, Monica Taylor and Red Dirt Rangers while adding 10 new voices to the lineup. 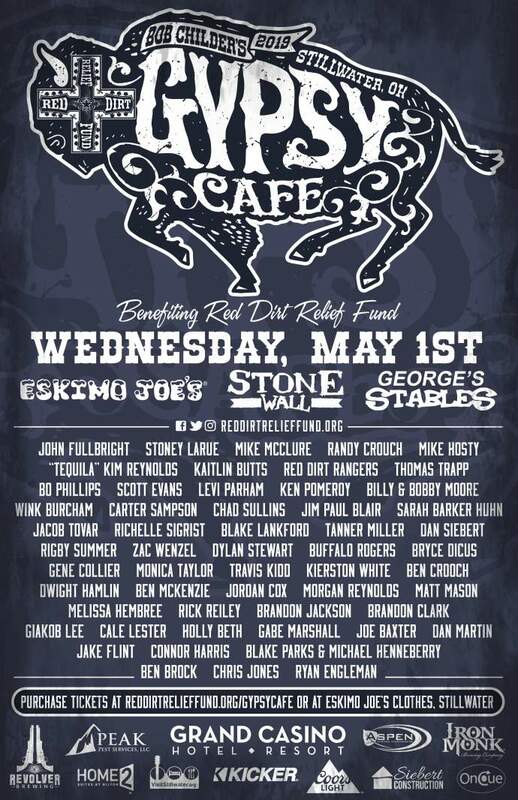 Nine of the featured musicians have benefitted from the Red Dirt Relief Fund. The all-star lineup includes “Tequila” Kim Reynolds, Scott Evans, Levi Parham, Ken Pomeroy, Thomas Trapp, Bo Phillips, Billy & Bobby Moore (of The Brothers Moore), Wink Burcham, Carter Sampson, Chad Sullins, Jim Paul Blair, Sarah Barker Huhn, Jacob Tovar, Richelle Sigrist, Blake Lankford, Tanner Miller, Dan Siebert, Rigby Summer, Zac Wenzel, Dylan Stewart, Buffalo Rogers, Bryce Dicus, Gene Collier, Monica Taylor, Travis Kidd, Kierston White, Ben Crooch, Dwight Hamlin, Ben McKenzie, Jordan Cox, Morgan Reynolds, Matt Mason, Melissa Hembree, Rick Reiley, Brandon Jackson, Ben Crooch, Brandon Clark, Giakob Lee, Cale Lester, Holly Beth, Gabe Marshall, Joe Baxter, Dan Martin, Jake Flint, Connor Harris, Blake Parks & Michael Henneberry (of Steelwind), Ben Brock, Chris Jones, Ryan Engleman (of Turnpike Troubadours) and more. The finalists of the Jimmy LaFave Songwriting Contest will be announced in early April, and the winner will be added to the lineup. WHAT: Oklahoma’s largest songwriter festival features acoustic pairings of some of the state’s best songwriters swapping songs and stories inspired by the godfather of Red Dirt, Bob Childers. Each set will include at least one Bob Childers tune. Sets will be staggered across three venues, culminating with an all-artist finale on the Grand Casino Main Stage at Eskimo Joe’s. All proceeds from the festival benefit musicians through the Red Dirt Relief Fund, a non-profit organization that provides a safety net of critical assistance to Oklahoma music people across all genres, not just Red Dirt. Operated by an all-volunteer Board, RDRF has granted over $100,00 to musicians in the state since 2012. Bob Childers’ Gypsy Café raised $30,764 for the cause in 2018, funding the full grant load for last year. The festival is seeking vendors to sell locally-made products in the festival grounds on Elm Street in Stillwater from 4-10pm on May 1st. Anyone interested should contact Sarah Stueber at smprobasco@gmail.com. WHEN: Wednesday, May 1st from 4:30-11:45pm. Forty-five minutes acoustic sets will be staggered at each venue to allow fans to catch the most music. The finale will begin around 11pm. The full pairings and schedule will be released in mid April. 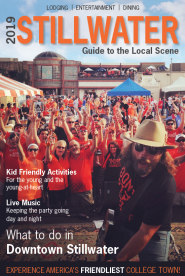 WHERE: All venues are in Stillwater, Okla.
HOW: Festival passes are $20 in advance at http://www.reddirtrelieffund.org/gypsycafe or in person at Eskimo Joe’s Clothes in Stillwater. Day-of tickets are $25 or $20 for students with ID. A limited number of reserved seating VIP tickets for Eskimo Joe’s Main Stage are $50. Fans interested in making a Red Dirt run in Stillwater can also purchase a “4-Day GA” Calf Fry ticket that includes a Gypsy Café festival pass athttps://amplitix.com/tumbleweed/20901. MORE INFORMATION: Visit www.reddirtrelieffund.org/gypsycafe. For media or sponsorship inquiries, please contact Katie Dale atreddirtrelieffund@gmail.com or 918-407-4599.